This site is devoted to the great American automobiles chosen each year to lead the pack at the Indianapolis 500. Known as "The Greatest Spectacle in Racing", the Indy 500 is about much more than which driver will take the checkered flag. It also gives auto makers the opportunity to take a production car and make it worthy of the Indy 500 badge. The Indy pace car represents the best in American automotive technology. This website explores the rich history and tradition behind these prestigious automobiles. After a three year hiatus, the Corvette returns in 2012 as the Official Pace Car for the 96th Indy 500. The ZR1 is supplemented by a fleet of 2012 Camaro SS convertibles. Our gift shop pages have finally been updated to reflect current inventory, and several new items have been added! T-shirts: Three new Camaro t-shirts and a retro Trans Am shirt too! 1/18 scale: 1980 and 1989 Trans Ams now in stock, plus hard-to-find previously owned models. 1/64 scale: Now in stock, the 2010 and 2011 Camaro pace car diorama pack from Greenlight! 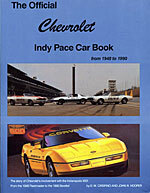 This is a must-have for anyone researching a Chevy pace car, especially the 1967 and 1969 Camaro or 1978 Corvette. You'll find information on VIN and cowl tag numbers you won't find anywhere else! These books are "new old stock" direct from the publisher. Purchase your copy today for only $16.95 (+ S&H). It can also be combined with any of the die-cast cars from our gift shop area. Looking for replacement pace car decal kits? Direct links to purchase select kits from Amazon.com, plus links to additional replacement decal vendors. Looking to buy or sell a pace car? Check out Collector Car Trader Online! Administrative note: The address "webmaster [at] indypacecars.com" is NEVER used for outgoing mail. If you receive an email from this address, it is a forgery and may contain a virus.